Arduino is a great microcontroller, but when you want the ability to easily scale your project or exchange components quickly, that’s where BoardX really starts to shine. BoardX is essentially a microcontroller motherboard, very similar to the motherboard inside your computer. Unlike Arduino and some other microcontrollers, the processor isn’t soldered onto the motherboard with BoardX. Rather, it’s soldered to a second board that stacks right on top of the BoardX motherboard. This allows you to easily swap it for a different one, or even add a second processor right on top. There aren’t a whole lot of add-ons for the BoardX right now, but if you have an idea for an add-on that isn’t available yet, you can get a blank board that’s fitted perfectly for building your own add-on. Built and designed by Kevin Green, the BoardX is currently on Kickstarter vying for your sponsorship and a spot in the real world. The board features a larger building base than an board Arduino does, reducing overall vertical height as you incur more add-ons. For example, a BoardX with 6 add-ons is about 3-inches tall. By comparison, an Arduino with the same expansions would be about a foot tall. The BoardX motherboard also provides more power for a wider range of power-hungry add-ons than Arduino currently does. 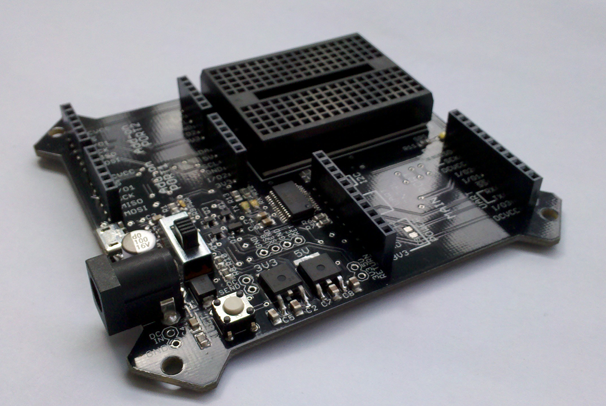 BoardX works with the Arduino SDK, so if you know anything about Arduino, you can get started right away. BoardX isn’t an instant replacement for Arduino, but it's something for people looking to be able to quickly modify physical components. Arduino does have the benefit of being wrapped up in a neat little package, processor and all, so if you already know what you need it might be a cheaper and/or neater option. However, if you’re looking for an alternative that lets you add a second processor on the fly, that seems like something unique to BoardX.